One of my favorite things about the bullet journal system is its ability to help you achieve and track personal growth. Whether it is tracking patterns from daily task lists, collecting data on habits, or being more thankful with a gratitude log, there is always something helping you grow. One of my favorite methods for fostering positive development is the Level 10 Life from Hal Elrod’s book The Miracle Morning. I have completed the Level 10 Life chart a few times and enjoyed it thoroughly every time. In fact, I create a fresh chart about every six months or so to try to track personal growth. It helps me identify areas of my life that I want to improve. Then I can take thoughtful, actionable steps towards those goals. 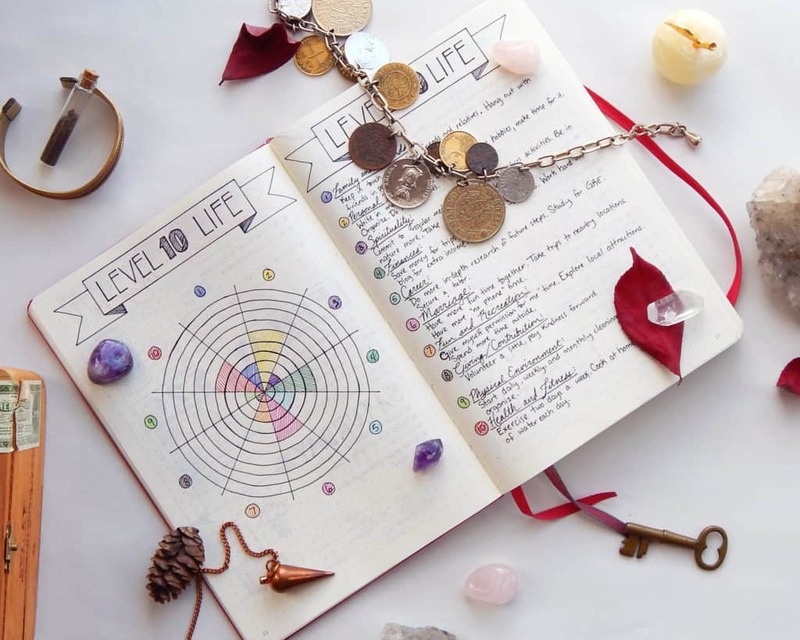 This is a bit trickier than you might expect, but the Level 10 Life chart helps you flesh out your true feelings about the many facets of your life in a simple but powerful way. 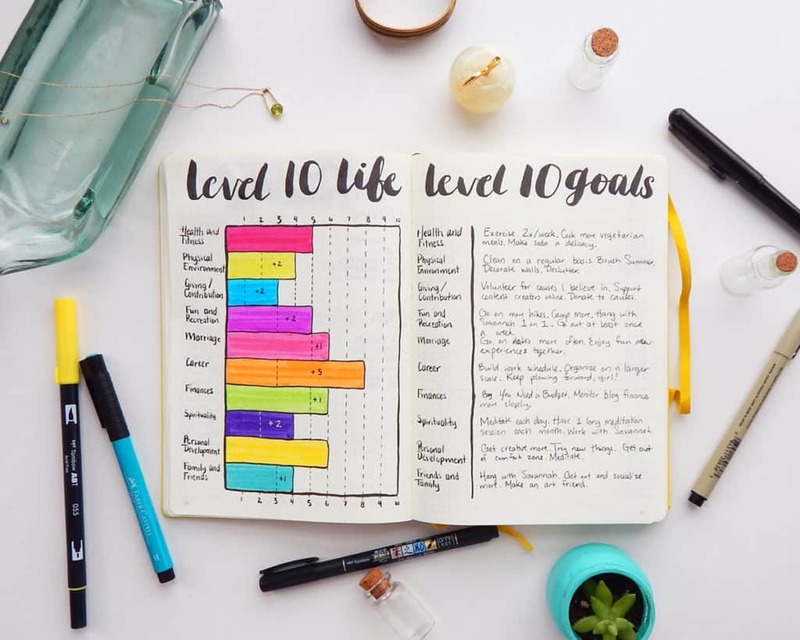 When I recently switched to my new bullet journal, I decided it was time to do another Level 10 Life to get an idea of my life’s landscape. While I have used this system and loved it, I decided to tweak the existing set up to make it work better for my needs. The results were way better than I expected. One of the most significant changes I made to my Level 10 Life set up is the format of the chart itself. It is most commonly seen as a circle with ten pieces of pie and ten levels within the radius. I used this layout for my first two iterations, and it is simply beautiful when it is done. However, drawing out ten nearly perfect circles and figuring out how to slice it into ten even sections is time-consuming. Even with the dot grid of my Leuchtturm1917, it was a lengthy process. Perhaps it would go faster with a compass, but those give me flashbacks to high school Algebra. No thank you! I decided to go with a simpler bar graph for this Level 10 Life chart. I created ten levels on the X-axis and the ten areas of my life on the Y axis in pencil. Then I inked it all with my Pentel Pocket Brush Pen and my Micron pens for the smaller details. I’m a stickler for that comic book hand-drawn vibe. Without looking at my previous charts, I rated each area of my life as honestly as I could. Then I used my Tombow Dual Brush Pens and colored in the bars. Well, except for the very last bar at the bottom. I ran out of Tombows, so I used my Faber Castell Pitt Artist Pen in cobalt green to complete the chart. When I was all done, I was thrilled with how vibrant and cheerful this chart turned out! Aren’t those colors just wonderful? Of course, I wrote out each section on the next page, using a Tombow Fudenosuke Brush Pen (hard tip) for the section headers. Then I wrote my goals for each section, so I know what steps to take next to continue my personal growth. Another edit I made to the original layout is the addition of the progress tracker. This is a feature that wouldn’t work for first timers to the Level 10 Life system. But would be perfect for anyone doing another chart after some time. You see, I struggled to connect a new chart to an old one in a meaningful way. I could go back and look at it, but I wouldn’t be able to remember what areas shrunk or grew since the last time. I decided to make that information more transparent. The method is simple. After I assessed each area of my life, I checked the last levels for each section in my most recent chart. I would mark the last recorded level with a dotted line on the new chart. In the space between the dotted line and the current level marker, I’d write how many levels I moved. For example, I did not feel very confident or enthusiastic about my career six months ago. I marked my career section at a measly 3 and moved on. This time, without referencing the old chart, I rated my career as the highest level on the whole chart at an 8. So I drew a dotted line on the three mark to indicate the last recorded level and wrote +5 in the margins to remind me of my astonishing growth. I did this on every level and was pleased to find that in no section did I lose ground. At worst, I made no progress toward my goals, and at best I made enormous leaps toward my ideal self. All around, I’m thrilled! 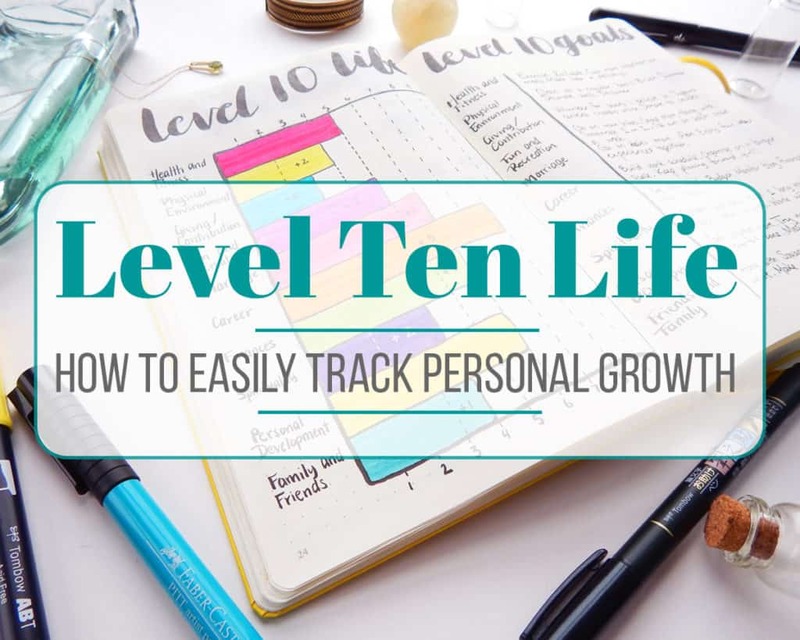 The Level 10 Life chart is an amazing tool for self-discovery and introspection. I would recommend that everyone try it at least once. And if you feel like the original version isn’t quite right for you, then don’t be shy about editing it! After all, it’s a tool for you to use – so make it work for you. I love the changes I made to my Level 10 Life and the personal growth that I saw. I can’t wait to see how I’ve grown next time! Do you rate each area out of 10 or order the areas 1-10? I rate each category on a scale of 1-10 with 10 being the highest! So if I’m feeling less than satisfied, I might mark it as a 4 or a 5, but if I’m feeling very happy with a category, I will rank it closer to 9 or 10. I hope that helps, Suzi! So I am a little confused about the actual use of it. Does it stay the same and you just use it to reflect and remind you what you need to work on and then you change it accordingly when you make a new one? Or do you add to it as you go? Which could be complicated if it fluctuates..
You use pens I have never heard of either but are probably mainstream for diehards.Great info! 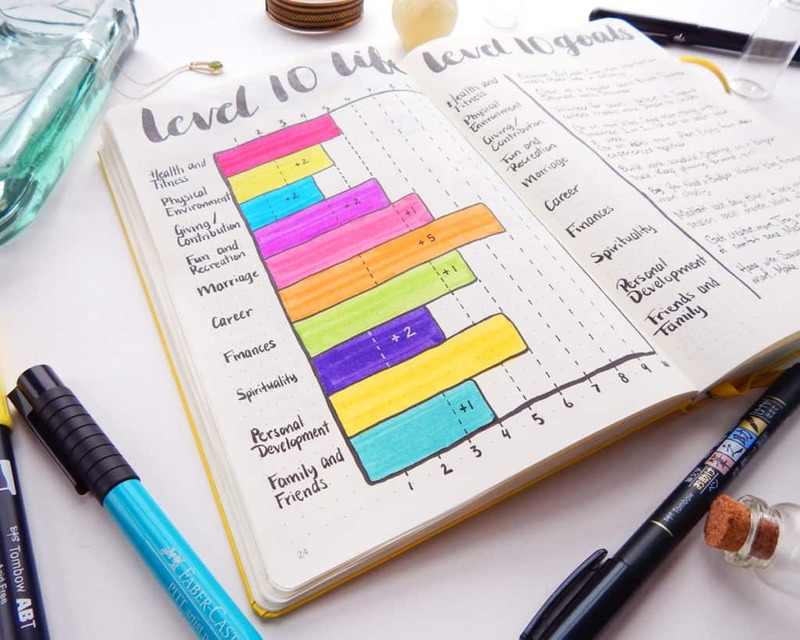 I always wondered about including the level 10 life in my bujo. However, I suffer with a mental illness which isolates me from friends and family and means that my friends and family section and my career section would always be pathetically low which rather than motivating me to change it would demoralise me. I wondered if anyone else had this issue? If so, is there any way around this? Has anyone tried just eliminating sections which will make them feel under pressure and a failure because they will never get where they want to be? That’s a great point, Jenn! Yes, you absolutely can eliminate or swap sections for your Level 10 Life. For example, I know some people nix “spirituality” because they don’t feel that section is relevant to them. So maybe add something like “hobbies”, “organization”, “self-care”, or something else in your life that you want to focus on. Or just take it down to 9 sections! In the end, the Level 10 Life is meant to encourage and inspire. If it’s having the opposite effect, don’t feel bad about tweaking it to fit your needs. Good luck! Sorry about your health problems. You could leave them out if you feel that is the best thing for you there are no rules or substitute them with something you feel is more relevant to you and in your control. I am also frequently disappointed with my friends and family areas to and just cause they aren’t there they don’t go away sometimes it is about accepting you are doing the best that you can right now learning not to put that pressure on yourself acknowledging that it is hard.